Ruben Flores (who likes to be called "Flo") started his pro baseball career in the Mariners organization. 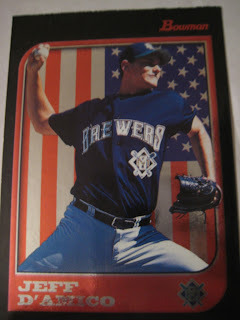 A Midwest League All-Star in 2009 with 18 saves for the Clinton Lumber Kings, he was traded to the Brewers on August 19, 2009 straight-up for veteran infielder Bill Hall. He kindly took the time to answer my questions about baseball cards. 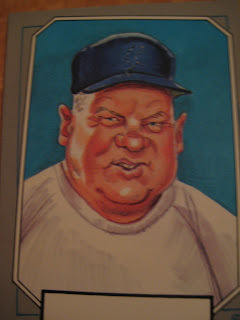 Bo Rosny: Do you have any stories about cards of yourself or of other players? Ruben Flores: Stories about my self unfortunately i don't have, but i can remember as a kid my favorite athletes were Michael Jordan and Nolan Ryan which might i add still are. But i can remember that one day eating cereal i saw on the back of the Wheaties box there was a chance to get a collection of Jordan cards if i mailed in like 10 upc's. So me being excited and wanting the cards, I asked my parents if we could buy the 10 boxes of Wheaties to get the UPC's so i could mail them in. I was happy that we were able to send the 10 upc's in but sad that i had to eat 10 boxes of Wheaties and let me tell you Wheaties don't exactly have the best taste for a 10 year old kid, i think by half way through the 2nd box i had given up and told my parents that i would work off the other 8 boxes. BR: Do you have a favorite card of yourself or of another player? RF: This last year i made the MILB Midwest league all star game which was pretty sweet and i got a baseball card that says exactly that. i thought it was pretty cool first one ever, hopefully more to come. BR: Do you collect baseball cards? RF: I used to collect them, i had a ton. I had all the players put by their team and position in a little binder in card sheets. I stopped after about 12 years old, just got way to busy traveling with my teams that i grew up with but something i could really get back into. What is Upper Deck to do? With Topps's new monopoly on baseball cards, they can't put team logos on cards. So will they merely rip the logos right off, leaving just a few threads hanging? Last night I was watching the MLB Network and there was a commercial for Topps. It was pretty bad, just a mishmash of cards flying across the screen. Pretty much looked like this except not staying on the screen long enough to make out any individual cards. Doesn't exactly make one rush out to buy baseball cards. 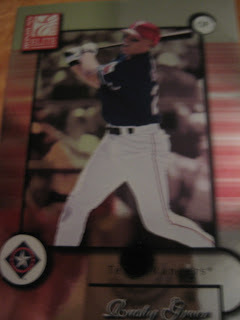 I guess now that they have a monopoly Topps feels like they don't have to try very hard. Living in baseball-mad New York, you can forget that in most of the country, football is more popular than baseball. 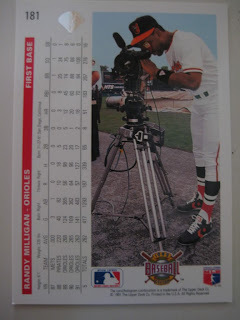 This is not usually reflected in baseball cards, but check out this 1992 Upper Deck card of Baltimore first baseman Randy Milligan playing with a camera in Memorial Stadium. It's hard to see, even when I zoom in on the camera, but if you have the card you can clearly see that the camera actually belongs to the Redskins. 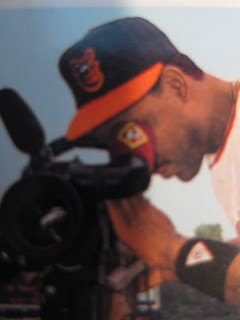 I guess the Orioles had to borrow cameras from the big football team in the area. I assume that these days the Orioles borrow their equipment from the Ravens. Kay thought it was very funny that it was a Toys R Us "Collectors Edition." Leiter said he remembered the card and thought it came with a toy - I think he was confusing it with a Starting Lineup card. 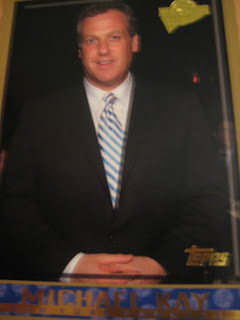 When Leiter saw the card he was struck by two things. 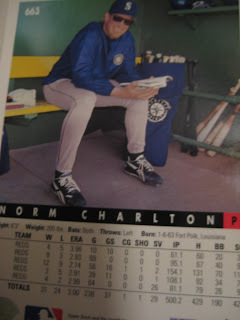 One was the stirrups - "Those weren't painted on, they're real stirrups!" More interestingly, he noted that his hands were too far back in his windup, which helped lead to the injuries he suffered early in his career. Kay jokingly asked how much it was worth, offering to sell it to Leiter. I looked it up on Beckett, and in mint condition is twenty cents. 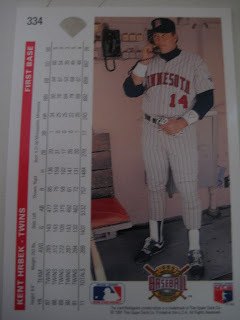 Kent Hrbek prank calling the bullpen. Mariano Duncan going earwax hunting. Steve Howe failing at push-ups. What do relievers do to kill time in the early innings of a game? Some catch up on their reading . . .
. . . while other exercise. 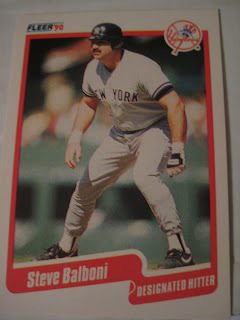 Rare baseball card with a player out of uniform, in shorts, wearing non-cleat sneakers. 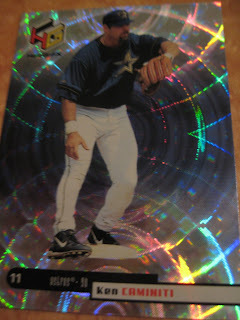 Here is a cool card from a set called 1994 Upper Deck Holo View FX. 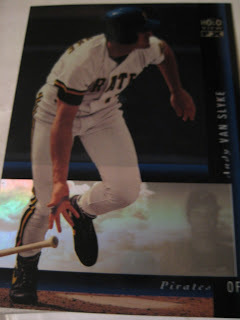 It features an action photo of Andy Van Slyke with a head shot in the lower right. 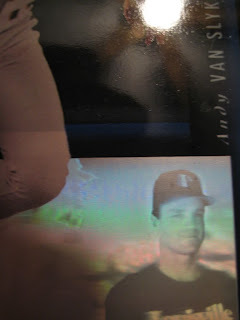 But no ordinary head shot - the holo view gives the illusion of Van Slyke turning his head and moving his face! 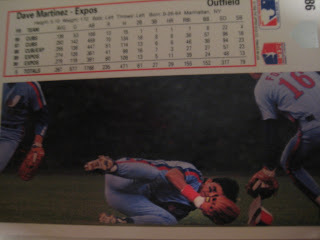 A while back I wrote about how baseball card photographers didn't seem to like Dave Martinez, as multiple cards showed him failing in the outfield. Here's another awkward picture of Martinez. He may have caught the ball, but this is not a flattering pose. In Thorzul's introduction to this blog bat around, he opines that fans in major markets haven't experienced humility, disappointment, and disgust. Then he posts a picture of bloodied New York Giant Y.A. Tittle. I may be too young to remember the Giants of his era and soul-crushers like the "Greatest Game Ever Played (Unless You're a Giants Fan)." I do remember more recent ones for the G-Men, most notably the 1997 Wild Card game where they blew a nine-point lead with less than two minutes left in the game. Except for one year, 1994, the Rangers have been pretty brutal to their fans. Ditto the Islanders after 1983. And few teams personify losing like the Mets, Jets, and Knicks. As a Yankee fan, I have been quite fortunate, although there have been plenty of down spots. The 2004 playoff collapse is an example, though there was an air of inevitability about that one. The three straight ALDS losses from 2005 to 2007 have been frustrating, and are the reason I don't expect much from them this year in the playoffs either - the Yankees have actually lost thirteen of their last sixteen postseason games. I've always preferred to lose a blowout to a close game, especially blowing a lead. Nothing is worse than losing a postseason series on a walkoff hit, but that has happened twice in recent years to the Yankees. The second was the 2001 World Series. I threw the TV remote against the wall (it broke) after this guy's lucky blooper. 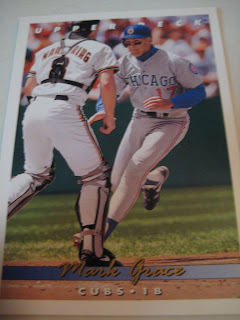 The website Hugging Harold Reynolds had a post about Mark Grace having a "friend" he has been "meeting" in St. Louis every time he comes to town for years. 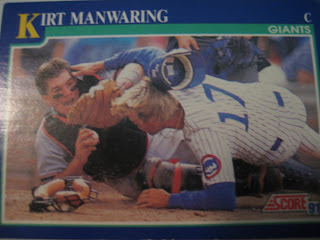 Wrigley Wax posted the link on his blog, and added a picture of this 1993 Upper Deck card of Grace "scoring the old fashioned way," featuring Grace about to make contact with Kirt Manwaring. A couple of weeks ago I sent a bunch of Dodger Stadium cards to Garvey Cey Russell Lopes. 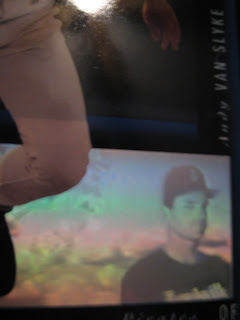 When he got them, he noticed that the picture on Damon Berryhill's 1991 Donruss card was actually from 1989, not 1990. Things like that are a bit of a pet peeve for me. I've always believed that a card set should be a chronicle of the previous season. Therefore, all photographs should be from that season. 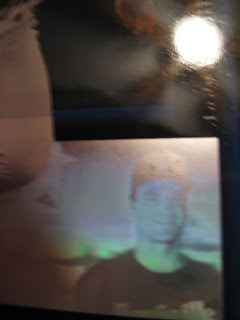 Berryhill's card was not the only one with a 1989 picture. 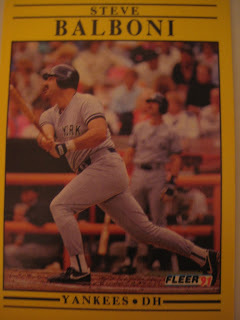 Steve Balboni's card is clearly from 1989 as well, as Don Slaught, who is on deck, was a Pirate in 1990. 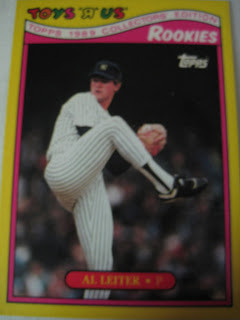 It's a shame they didn't use that picture on his 1990 Fleer card, it is a lot more interesting than the one they did use that year. This is actually one of the most interesting cards in that snooze-fest of a set. Brady Raggio pitched thirteen years of professional baseball, including three years in the major leagues with St. Louis and Arizona. He is now a corporate sponsorship account executive with the Diamondbacks' Triple-AAA affiliate, the Reno Aces. He kindly took the time to answer my question about his favorite card. 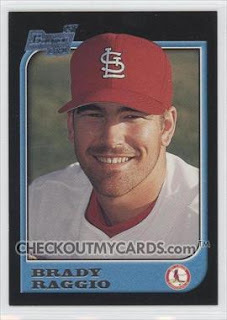 "My favorite card of myself is from 1997, when I was with the St. Louis Cardinals. It is just a head shot, but the background is our American Flag. 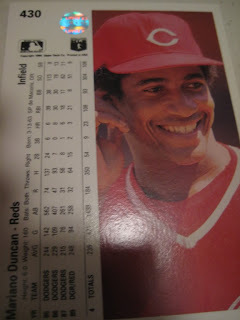 That was my rookie year in the big leagues, and I heard that the rookies that year for that set of cards got the flag of their country as the back drop." Thanks, Brady! 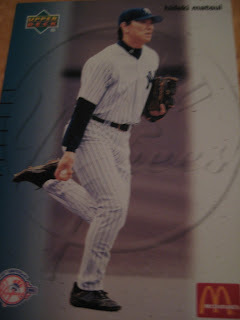 The card is from the 1997 Bowman International parallel set. 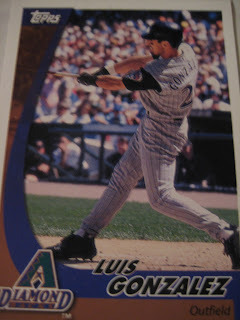 I couldn't find a picture of this card, so here is a picture of his regular 1997 Bowman card as well as an international card, so you can imagine what it would look like. 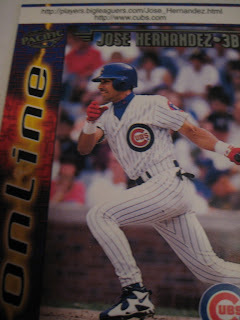 Another early awkward attempt at integrating baseball cards and the internet was 1999 UD Choice. 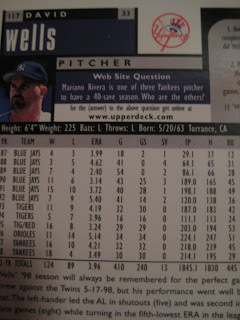 Each one featured a trivia question on the back, such as this poorly-written one on David Wells's card: "Mariano Rivera is one of three Yankee pitcher to have a 40-save season. Who are the others?" Each card would then say "for the (answer) to the above question get online at www.upperdeck.com"
I got online at www.upperdeck.com but couldn't find the answer, but that's OK because I knew it anyway. Dave Righetti and John Wetteland. 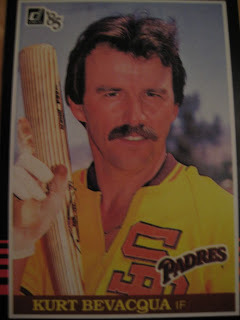 Styled hair (no cap), perfectly trimmed mustache, shirt open to reveal one chain (no multiple chains or chest hair), bat held at a rakish angle - Kurt Bevacqua is doing his best to make one of the most infamous jersey designs ever to look good. Got this odd card in my trade with Gooch. 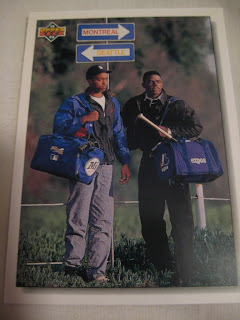 Its a 1992 Upper Deck checklist card that features Mariners prospect Marc Newfield and Expos prospect Rondell White. I thought that it was commemorating some kind of trade, but these two were never traded for each other. Weird. It's 2:56. Do you know where you're third baseman is? Either he is playing a very deep third, or Mike Blowers should really be called a 3b-of on this card. 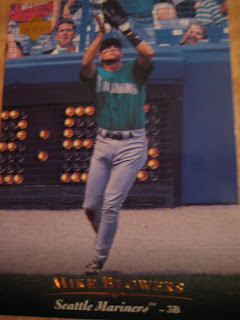 Interestingly, even though he only played nine games in the outfield in 1994, he did so in all three Mariner day games at Tiger Stadium, including his only right field appearance of the season. http://players.bigleaguers.com/Jose_Hernandez.html is now a dead link: "Firefox can't find the server at players.bigleaguers.com." At least they weren't links to Geocities or Angelfire sites. 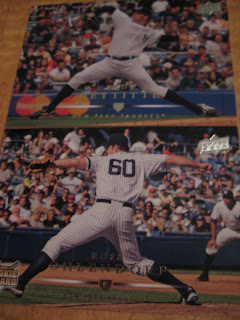 I recently did a trade with The Gooch, a Yankee fan with a new blog called In The Ballpark. I sent him a bunch of Yankees (mostly doubles from my recent trade with GCRL) and in return he sent me some Marlins, Cubs and Mariners he had too many of. The great thing about being an omnivorous collector is that cards from any team, not just your favorite, are fun. 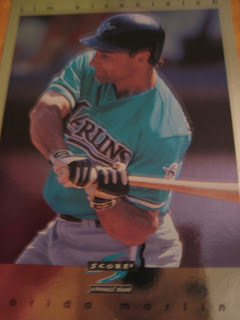 Getting a couple of hundred Marlins cards was a sea of teal that actually looks pretty cool. Here's Steve Buechele with his little Cub. 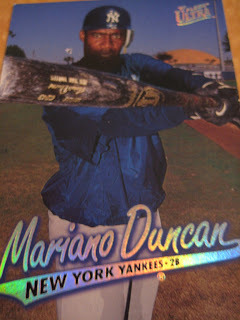 Current Yankee Damaso Marte's rookie card in 1999 Fleer Tradition Update. 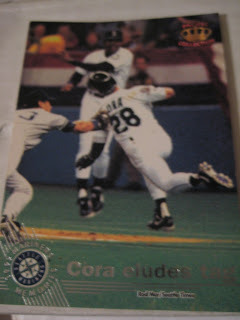 Gooch must have a ton of this set - I got about ten cards of each Mariner, Marlin and Cub in the set. If you have any needs for this set, let me know (or maybe let him know!). Also if you have any Mariner, Marlin or Cub needs or if you collect one of the teams and want to do a general trade let me know! Here is my 6-in-30 from the second of my two binders. 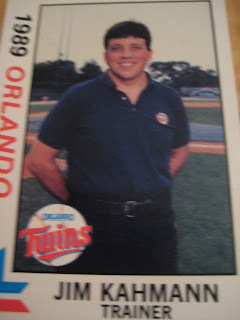 Last time I had a minor-league trainer card. 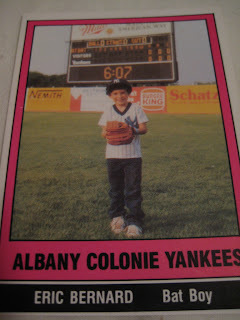 This time it gets even more obscure - a minor-league batboy card! It is cute, I'll admit. After that card, I got seriously distracted by shiny things. This Summit parallel set may be my favorite of all time - so sparkly! Look, you can see the reflection of my camera! Here too, though what actually caught my eye was the bright red batting helmet. 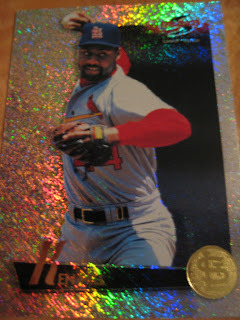 Here's a nice card of Chili Davis. He often gets forgotten when fans remember the 1998-99 Yankee teams, which made it cool when at Yankee Stadium on Monday they showed a nice highlight clip of Chili between innings. 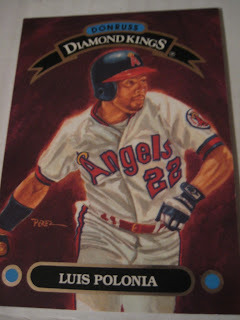 A speedy, exciting player, Luis Polonia played twelve years in the major leagues, mostly for the Yankees and Angels, stealing over 300 bases and compiling a lifetime batting average of .293. His last major league hit was his biggest, a pinch-hit single in the bottom of the ninth inning of Game 1 of the 2000 World Series that helped sparked the Yankees' comeback off of Armando Benitez. Polonia now owns a successful baseball academy in the Dominican Republic and kindly took the time to send a brief reply via blackberry to my inquiry about his baseball cards. "I have most of my b cards and a drawing picture bb card with the angels is my favorite." Thanks! As a Yankee fan, I'm a bit disappointed his favorite wasn't one with the Bombers, so here's a great shot of him running the bases in his second of three tours with the Yanks. Ben Petrick played in parts of five seasons for the Rockies and Tigers. 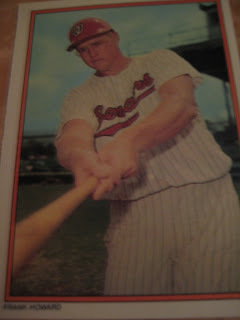 In 669 major league at-bats (equivalent to one full season) he hit 27 home runs and had 94 RBI. Forced to retire at the age of 27 due to the effects of Parkinson's Disease, he is now the head instructor at Baseball Mastery as well as a high school baseball and football coach. He kindly took the time to answer my inquires about baseball cards. "There are some cards of myself that I like more than others, I tend to like the offensive cards, like hitting action shots rather than catching cards. 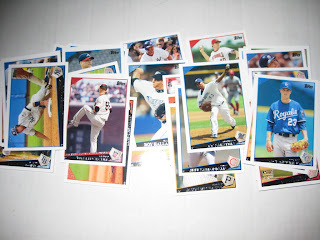 I don't collect cards anymore, but growing up it was one of my favorite hobbies." 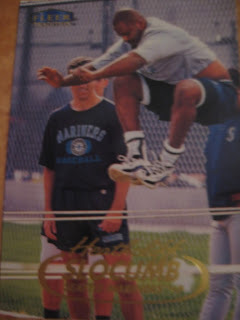 This is not the only trainer card I have from a minor league set. Apparently they are often included, but never in major league sets. 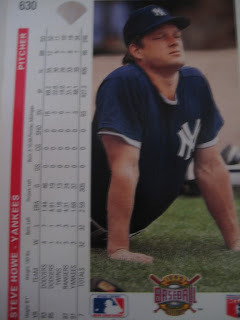 Gene Monahan has been the Yankees trainer for 44 years and as far as I know has never been on a card. 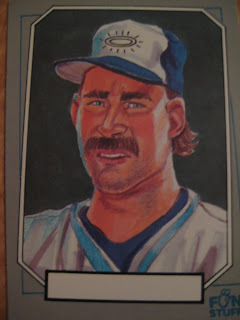 Not so for Jim Kahmann of the 1989 Orlando Twins. Nothing special about this card, just a great photo of the Capitol Punisher. 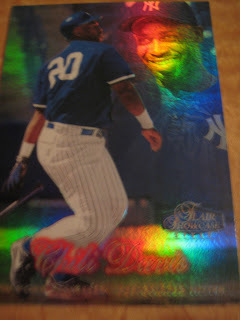 The light glinting off of Mariano Duncan's shiny signature caught my eye. This one only caught my eye because I happened to have YES on in the background and he was talking just as I passed his card, on the same page as the Duncan. My last entry is cheating a bit, it's actually two cards, but it was their juxtaposition next to each other on the page that caught my eye. Great day at the ballpark!